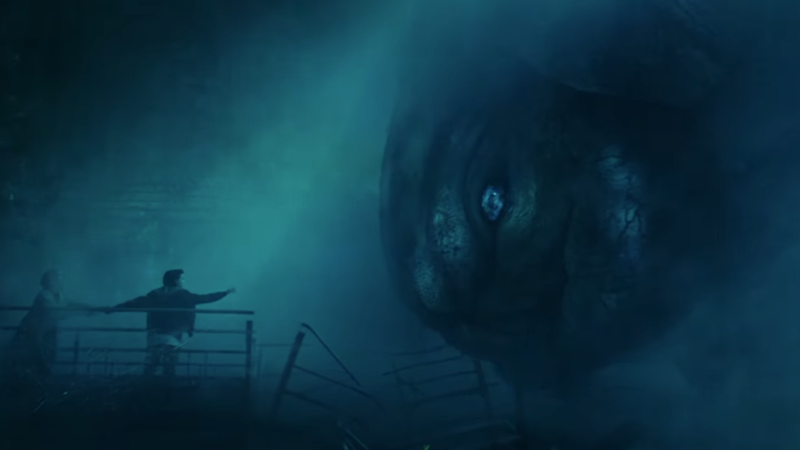 Millie Bobby Brown encounters Mothra in the King of the Monsters trailer. Godzilla: King of the Monsters’ first trailer didn’t just bring the big G with it: it promised, well, monsters. Several of them, actually, all ready to challenge him for his title. For fans of Godzilla’s many Japanese films, these foes are some iconic familiar faces, but if you’re fresh to the world of Kaiju outside of the 2014 Godzilla movie, here’s what you need to know. A quick note going in: despite these creatures (Godzilla included) being known as Kaiju—the Japanese word for “strange beast,” and the name of the genre of giant monster movies Godzilla and his pals popularized, you probably won’t hear that term in King of the Monsters. Instead, it uses an alternate, Westernized bit of terminology for its giant beasts—Titans—since it’s set in the world of the 2014 Godzilla reboot, directed by Gareth Edwards. Despite this, these giant monsters are still meant to be the equivalents of their old-school counterparts in the vast genre of Kaiju movies, so we’ll be using it below in reverence to the decades of history these legendary beasts are wrapped up in. Now, without further ado: the Kaiju! On the left, Rodan emerges from its Volcanic crucible in King of the Monsters; on the right, his first appearance in Rodan. The oldest of the Kaiju introduced in King of the Monsters, Rodan—actually known in Japan as Radon, a squishing of the word “Pteranodon,” the slight alteration made so Western audiences would not mix it up with the element of the same name—first appeared in 1956, two years after Godzilla’s gargantuan debut. Although originally intended as a standalone movie monster, Rodan was integrated into the wider Godzilla franchise with the arrival of Ghidorah, the Three-Headed Monster in 1964 (more on that in a bit). As you might not be shocked to learn, given its naming inspiration, Rodan is essentially a gigantic Pteranodon which survived for millions of years under the earth, enlarged by radiation, before dramatically bursting out of a volcano. Originally, Rodan was meant to be a whole species of mutated Pteranodon, but when the monster was brought back for Ghidorah, it was reconceived as a singular monster akin to Godzilla and the other legendary kaiju. Rodan’s gigantic size and cosmic radiation grant it the ability to fly at super-speeds, and it can create massive shockwaves with its wings capable of leveling buildings. On top of that, its radiated skin can deflect almost any attack, even Godzilla’s infamous atomic breath. As well as having similar origins to the original monster, the Rodan of King of the Monsters appears to have at least one extra ability—the trailer shows its body covered in lava, pulsing as it flies around. Whether that’s just a by product of having, you know, just exploded itself out of a volcano, or a new elemental ability—the tie-in viral website for the movie seems to indicate it’s just part of Rodan’s body now—remains to be seen. Mothra unfurls her wings in King of the Monsters, and takes to the skies in Mothra. Making a debut in the self-titled (and batshit wild) 1961 movie, Mothra is a different kind of Kaiju superstar. Although dangerously powerful, Mothra has primarily been portrayed as a heroic creature since her debut, a fierce protector of her fairy-populated island home and eventually the world at large, summoned by humanity as its first line of defense against the likes of Godzilla, Ghidorah, and other giant monsters. Hell, at one point in the ‘90s Toho had to create an evil clone of Mothra, Battra, just to use the giant moth concept in a villainous capacity. Like other Kaiju, Mothra’s abilities have fluctuated over the the years. While she’s always had typical bug-like abilities like bites and silk-spraying ranged attacks, some forms have been able to shoot laser beams from her antennas, or create shields to deflect projectile attacks from other creatures. One consistent power of Mothra’s is her ability to re-incarnate, creating an egg of herself upon death from which a new Mothra will eventually erupt, ready to protect the world. The shadow of Ghidorah looms large in King of the Monsters, next to its gleaming appearance in Ghidorah, the Three-Headed Monster. One of Godzilla’s oldest foils, Ghidorah was first introduced in the aforementioned 1964 film Ghidorah, the Three-Headed Monster as a great and often far more sinister rival to Godzilla, rather than as simply another creature out to wreck Japan. As portrayals of Godzilla moved from existential threat to quasi-ginormous hero, Ghidorah has remained one of the Big G’s persistent foes. The multiple eras of Godzilla movies have brought with them different origins for Ghidorah—originally, he was a being from outer space who came to Earth in a meteor after destroying the alien civilization of Venus thousands of years prior. In 1991's Godzilla vs. King Ghidorah, Ghidorah was a genetically modified Kaiju created in the far future to go back into Japan’s past and stop it from becoming a domineering global superpower in the 23rd century. Most recently, Ghidorah has been given a spiritual background, reimagined as a resurrected ancient guardian spirit, transformed by Mothra to help combat Godzilla’s return. But for all these different interpretations—and now including King of the Monsters—one thing hasn’t really changed since Ghidorah’s debut in the past five decades: its design as an armless, winged, three-headed dragon. Ghidorah’s abilities have likewise fluctuated over the years. Although the ability to fly and shoot beams of gravity energy from its three heads have been the most persistent of Ghidorah’s powers, it’s been able to do everything from regenerating damaged parts of its body to shooting lightning from its wings. The King of the Monsters tie-in website reveals that this latest version appears to lift from those electricity-based abilities, giving it the power to generate a bio-electric field through its scales, and create thunderstorms and hurricanes with the strength of its wings and electrical discharges mid-flight. The Godzilla Sequel Will Feature Mothra, Rodan And King Ghidorah!